Today’s topic is a rare Italian wine from Piemonte – Ruchè di Castagnole Monferrato. If you’ve visited the Fancifull Gift Baskets web site or followed any of our blogs, I’m sure you’ve noticed how passionate we are about the foods we carry in our store and put into our gift baskets. Many of these require some clarification. This is certainly true in the case of the lovely Ruchè grape with it’s enticing floral and wild berry aromas. “If it’s so good”, you may ask, “why haven’t I heard of it before it appeared as an option in one of your wine gift baskets?” Well, there are two reasons. Firstly, there just isn’t much of it! 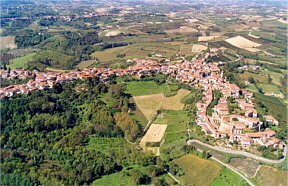 The Ruchè grape production comes from a mere 100 acres of vines in the region of Castagnole di Monferrato, which is near Asti in Piemonte, Northern Italy. Secondly, the wines that get the attention in this area are the three B’s made from the Nebbiolo grape: Barbara, Barbaresco and Barolo! Tough competition indeed. But Ruchè (pronounced roo-KAY) is an absolute delight to have on the dinner table – and at a very affordable price. So, next time you want to send someone an Italian gift basket or just surprise them with a new wine in one of our wine gift baskets. I highly recommend this rare little gem that we have here. My mouth is watering just thinking of it and a creamy Gorgonzola cheese. And I’m really looking forward to trying this wine with the winemaker at his vineyard next week. Yes, we are headed for Italy, and this is one of our stops. Buon appetito!